Should I use a one-page or a multi-page website? It’s time for a new website. 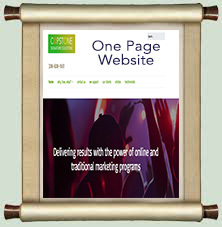 You have done the research and learned that one of the trends (some would argue it’s a fad) in website design is the “One Page” website. The big question, “Is the one page website right for your needs?” Let’s review the differences between a one page and traditional websites. In its easiest form a multi-page website is like reading a traditional book, with its content divided into chapters and pages you flip through A one page website reminds me of viewing content from a scroll. It is one long continuous read from the top to the bottom of the scroll. • Display high end products with a need for high quality images and special visual affects such as parallax scrolling. • One off situations such as meetings, competitions, or personal events such as weddings. 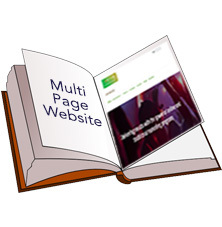 When should you stick with the tried and true multi-page website? • You have an in-depth story to tell that requires significant education and multiple communications. • If your story is rich-media heavy, a multi-page site is usually better for your needs, based on upload times. To choose the design that is right for you, determine your objectives, work with your website developer to decide on the best design, and than don’t look back. Remember your content (see article “Content is King”) is the most important factor in deciding which design is right for you.